The Gallery Solaris HE gas fire in chrome is a beautifully crafted glass fronted gas fire that boasts an 80%+ heat efficiency rating. The slide control is conveniently located at the side to prevent having to bend down or contort yourself in order to quickly operate this handsome unit. Its fire front is fashioned from antique brass that attractively complements a wide range of room décor styles. It fits any standard 16" by 22" high opening and is suitable for connection to either Class 1 or Class 2 chimneys.This high-quality slide control gas fire not only provides an ample 4kW output of constant clean heat, it also features the same living flame and glowing coal effect that a traditional gas fire does, but without any of the hassle or fuss. Families and individuals watching their budget love this unit's low operating cost and ease of use. Once the Gallery Solaris HE gas fire has been switched to the operating position, it provides a continual stream of comfortable heat as well as light but without the danger of open flame or smoke associated with solid fuel fires. The only maintenance required for safe operation is a proper fuel connection and a annual inspection by a Gas Safe registered engineer to ensure years of warmth and enjoyment. 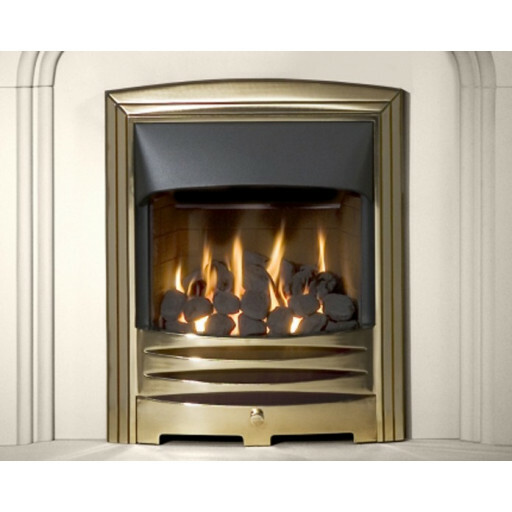 was after a contemporary looking gas fire in chrome and went to the fireplace warehouse and purchased an Aurora glass fronted high efficiency gas fire that was in stock for me to take away the same day. Great service from a very friendly and helpful salesman called Jon Halliday.